Before going to the Philippines I did a lot of research, trying to decide which of the 7000 islands I should visit. I don’t think I could have made the wrong choice because all the islands look pretty amazing. Nevertheless, I was very pleased with my decision to go to Bohol! We stayed at some very nice accommodations, transport was effortless (thanks to very friendly locals and a great amount of luck) and we ate great food at Alona Beach. And off course it was gorgeous everywhere we went. One of the highlights was a sightseeing trip with a scooter around the inlands of Bohol! Also read my other posts about the Philippines! Read about our Philippines travel budget, our 3 week Philippines itinerary, our 3 day hiking trek in Batad and our PADI course in El Nido! These weird monkeys are one of the smallest of their kind and look like they came straight out of a comic book, with their too big for their skull eyes (did you know that their eyes are larger than their brain!) and tiny claw like hands. What I liked about the sanctuary is that there are one or more caretakers for each Tarsier, urging every approaching visitor to be very silent and not to take photos with a flash because, when stressed out, Tarsiers have a tendency to commit suicide… It’s true, read it on Wiki. Again, weird little creatures! Before reaching the Chocolate Hills we passed the Butterflies Conservation Center. For both the Tarsier Sanctuary as well as the Butterfly Sanctuary I’m not sure how I feel about visiting them. I mean, if I were a butterfly I probably wouldn’t enjoy being put on someone’s nose 100 times a day. And with the Tarsiers so sensitive to stress, being constant gawked at by tourists (including myself) cannot be good for them. But… these sanctuaries do provide local people with jobs and an income. And allows for a Tarsier Sanctuary to exist at all, not unnecessary since they are an endangered species. So I am a bit torn about these attractions. Please leave a comment below and tell me what you think! These crazy hills are a real mystery, read some of the best legends about them. It was so much fun driving around on a scooter and while all the stops were interesting, what I loved most was seeing how people lived in the little villages we passed. And driving through the changing landscapes, which ranged from flat agriculture fields to narrow and steep mountain roads. Isn’t this the coolest bus stop you have ever seen! We drove from our cute bungalow in Loboc (Fox & Firefly Cottages) to Carmen, where the Chocolate Hills are, and back the same way. All the sites mentioned above are on this road, you can’t miss them! Check the map below for more information. You can download the map and table with the costs for a day of sightseeing below! I had a great time on Bohol and will definitely go back to do more exploring if I get the chance! PS. I am sure I’ll remember this day forever because it left me with a permanent reminder:-) Every time I look at the scar left by burning my leg on the scooter exhaust it reminds me of our 5-month trip, this great day on Bohol in particular. 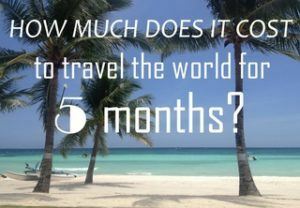 Previous Post: « How Much Does It Cost To Travel To The Philippines? I really wanted to go to Bohol and see the tarsiers. Unfortunately the ferries didn’t go because of a typhoon, so I got stuck on Negros and then want to Cebu. Cebu is also nice, but I’d love to see the tarsiers one day…. Au, die brandblaar… 1 keer bijna gehad, maar gelukkig net op tijd in de gaten. 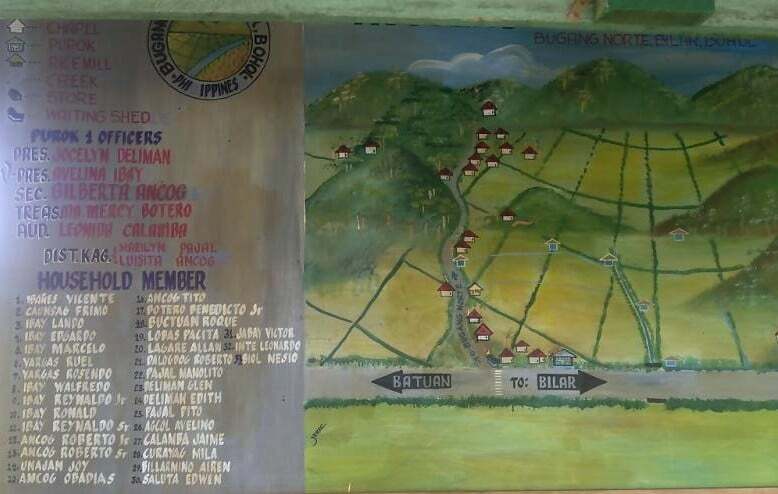 Bekende route, mooi is Bohol! En die Chocolate hills, die zijn echt super als de zon er een beetje bij komt. Wij hadden bewolkt met perioden met zon, waardoor 1 of 2 heuvels oplichtten, bizar gezicht. Haha, ja dat was minder prettig… Maar wel een permanent aandenken aan onze mooie reis;-) Gaaf dat je ook op Bohol bent geweest en de Chocolate Hills zijn echt fascinerend! Haha, het is zo grappig en zielig tegelijk voor de beestjes. Ik snap je twijfels volledig, al zou ik toch ook gegaan zijn. De locale economie steunen (die dan ook nog eens belang heeft bij natuurbehoud), lijkt me zeker wel te verantwoorden. Ohnee je been! Een vriendin van mij heeft exact hetzelfde gehad in Indonesië, altijd uitkijken met die scooters ;). Achja, deed op dat moment behoorlijk pijn maar heb er een ‘mooie’ permanente herinnering aan over gehouden;-) En ik ben sindsdien nooit meer aan de verkeerde kant van een scooter afgestapt!